The PURE Evoke 2S speakers (2 mid-range 3″ drive units + two 3/4″ dome tweeters) deliver 2x15W (30W RMS) audio output and offer the best sound of all the budget/midlevel digital radio’s I’ve tested. It’s hard to describe why this radio sounds so good but whether listening to news reports on SBS 6 (BBC World Service rebroadcast), rock music on WSFM Classic Hits or a symphony on ABC Classic FM the sound combines the warmth of a analog radio broadcast with a crisp clear sound and solid mid range/bass without distortion. This makes competing digital radios with a mono speaker sound very poor in contrast. Speakers: 2 mid-range 3″ drive units + two 3/4″ dome tweeters) deliver 2x15W (30W RMS) audio output. Output sockets: 3.5mm headphone jack, 3.5mm line out (analogue). Power consumption: Standby 0.95W (industry average 2.64W); in operation 3.2W (industry average 5.49W). PURE has included a useful extra feature called “REVU” which lets you pause a radio broadcast (eg: if you’re interrupted by a phone call) and restart playback afterwards (up to 15min later). Pause/rewind is one of the features which was heavily promoted by Commercial Radio Australia when digital radio was launched but I say they were disingenuous because its a feature of only a fraction of digital radio’s on sale in Australia. There are plenty of nicely sized preset buttons which you can program with your favourite radio stations and the silver Volume/Tuner knobs give a clear clicking feedback so you can hear how fast they’re being turned. One clear design flaw is no clear indication of whether the radio is on or not because the display auto-dims depending on ambient light. Several times it wasn’t obvious whether the radio was on or off and it got left on all day. While an iPod Dock with remote (PURE i-10) is available for roughly $80 the lack of WiFi internet radio capability and/or the ability to access music/audio files on a shared network drive via WiFi is puzzling because it would make this radio almost perfect. The PURE EVOKE-2S is RRP $699 in Australia but retails for $599+delivery from techbuy.com.au. 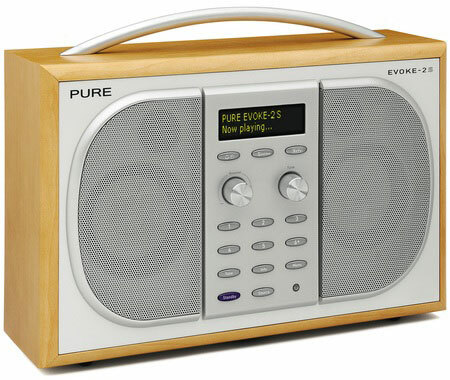 Sources in the UK tell me they can buy the PURE EVOKE-2S over there for about 170pounds (equivalent to $AUS 336). For more details about the Evoke 2S visit the PURE Australia website. The [PURE EVOKE] 2S has two stereo speakers plus 2 tweeter speakers and delivers 30W of audio output. It’s noticeably the best sounding “basic” radio, with incredible punch and fully rounded audio. It allows you to pause and rewind upto 15minutes of broadcast content, as well as pause and rewind the scrolling text. The maple veneer looks won’t be for everyone but our main concern is the price at RRP $699. The most appealing aspect of the Evoke-2S is its sound. It uses PURE’s Clearsound technology. It has “bigger than you’d expect” sound, excellent speech and vocal tonality, and, with a little juggling of the tone controls it’s capable of delivering music in a highly attractive fashion. I was able to compare this model with the Evoke-2XT, the sound quality of which is anything but disappointing, and the new model is clearly more powerful, more detailed and easier to enjoy. Add to that the winning combination of features and the logical, intuitive operation and this is clearly a highly attractive choice for the serious radio fan. The Evoke-2S isn’t just PURE’s best-sounding radio to date; it’s the company’s best product, full stop. 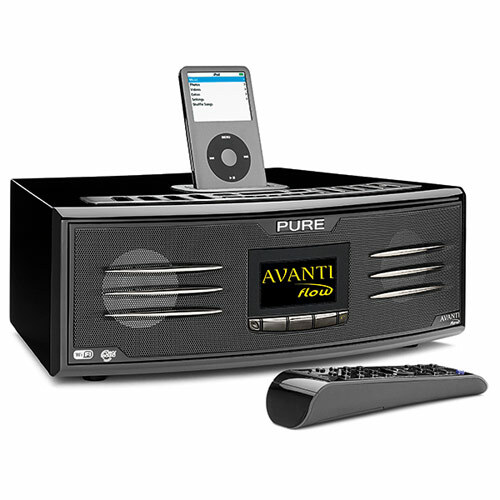 It would be wrong to call the PURE Avanti Flow “just a Digital Radio”, it’s better to think of it as a mid-level hi-fi system for the digital age with an iPod dock and WiFi radio capability instead of a CD player. In terms of sheer power and better bass thanks to it’s subwoofer the PURE AVANTI Flow sounds better than the EVOKE 2S but not by much. Key features include DAB+ digital radio, powerful power output of 75W RMS total (2 x 20W + 35W subwoofer), design that would fit well on a shelf or tabletop and the aforementioned streaming WiFi radio and iPod dock. All these features can be controlled with the bundled well designed remote control. PURE shows thoughtfulness by packaging the AVANTI Flow in a soft drawstring bag so it won’t get scratched while being shipped to you. It also has rubber feet to make sure it doesn’t slip around on smooth/glass surfaces with a similar rubberized feel on the bottom of the remote. The display has 6 lines, 4 of which diplay radio station related information and in a nice touch the information on screen scrolls smoothly vertically down rather than all the other radio’s I’ve tested which scroll horizontally right to left. Remote: Reach F10 RF remote control. As a product with a premium price (RRP $999) it’s strange that PURE didn’t include a LAN 10/100 network port, their REVU (pause/rewind) technology and take more time to improve the function icons/text on the shiny silver buttons across the top of the system which are very difficult to read unless you look directly down at them. Also while it has WiFi streaming radio capabilities the only navigation methods to choose a station are a giant list in alphanumeric order or searching for a name using the remote, both of which are tiresome. In comparison the OXX Digital radio powered by Frontier Silicon software categorises WiFi radio stations by genre and location which makes it really fast and easy to narrow down the options to a small number of stations. Thankfully the Australian retail prices seem to be much lower than the RRP of $999, I spotted the PURE AVANTI Flow as low a price as $798.85 at Ryda. This compares to British prices of 241.70 pounds ($472.76) at Amazon UK. For more details about the PURE AVANTI Flow visit the PURE Australia website. The RRP $999 PURE AVANTI FLOW has an iPod dock and superior 75W of output including a subwoofer. It’s the best sounding radio of all but the price is high. PureSOUNDS lets you play noises such as seagulls, thunderstorms, guitar tuning and heartbeats to help babies sleep. PURE’s “The Lounge” website means finding internet radio stations and scheduling their recording and playback is a breeze. Having already garnered five-star reviews from BBC Music for its EVOKE-2S DAB tuner and EVOKE Flow internet radio, we were expecting great things from PURE’s iPod dock radio, the Avanti Flow – and it didn’t disappoint. This thoroughly modern desktop iPod system incorporates a DAB/FM and internet set-up into its solidly built glossy chassis. The internet radio proved incredibly straightforward to set up via a Wi-Fi connection while you can easily manage and synch station favourites via www.thelounge.com. Sonically it excels – our expert listeners were impressed by its sound quality on a wide range of different music types and also with spoken voice, rating it as one of the best digital radios they’d heard. Sound quality is helped by a large speaker mounted in the bottom of the radio, which gives it a good bass sound. On the downside, we didn’t find it particularly easy to use, mainly because of difficulties in finding and navigating round the internet stations. The remote control buttons and menu structures are confusing and not intuitive – you’ll need to learn you way around this radio before you feel comfortable with it. True a lot more digital radios are sold in the UK and the market there is both more competitive and mature but these days consumers can easily use the internet to compare prices in different countries and judging by discussions on Australian technology chat forums quite a few people have done so and are angry/annoyed by the relatively high digital radio retail prices in Australia. If you buy a PURE EVOKE-2S from the UK via a company like Nevada Radio once VAT is removed from that price and delivery to Australia added the total price is appx $AUS400 including delivery. Note: I don’t think the independent distributor of PURE radio’s in Australia would honour any warranty claims considering you didn’t buy it from them. Hopefully the Australian retail prices for PURE will fall within a few months and WiFi capabilities are added to the next version of the PURE EVOKE-2S because without it the product isn’t able to be used to best effect. In the digital world a huge amount of range of content always trumps a small amount which is why I predict that digital radio’s with the ability to choose from 1000’s of WiFi radio stations as well as DAB/DAB+ broadcast digital radio stations will triumph in terms of sales. I’ve just bought the Pure Evoke Flow, plus the extra speaker, plus the remote control, plus the rechargeable battery pack and including UPS delivery from the UK to my home in Sydney for under $500! Come on Aussies, get you act together on pricing, current prices here are, as usual, a rip-off! !